A short film shot by Hans Kemp of Visionary World and Crime Wave Press of a talk I gave in May 2011 about my then forthcoming book Sacred Skin, co-authored with Aroon Thaewchatturat, and published by Visionary World in July 2011. 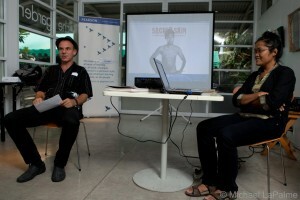 The talk took place at the first Bangkok Literary Festival at the Neilson Hayes Library. Since then, Sacred Skin has been reviewed in thirty publications including TIME Magazine and has been the subject of two documentaries. Sacred tattoos, called sak yant in Thailand, have been around Southeast Asia for centuries and afford protection from accident, misfortune, and crime. Young women get tattooed with love charms in order to attract better partners, while adolescent men use the protective power of their yants in fights with rival youth gangs. For most though, the tattoos serve as reminders to follow a moral code-endorsing positive behavior. At the time of the application of a sak yant, the tattoo master establishes a series of rules that his tattooed disciples will have to follow for the rest of their lives, usually starting with Buddhism’s first five precepts. Failure to observe the guru’s instructions will cause the sak yant to lose their power. Yet there is more to this than the written word. It goes deeper. This book serves as an introduction to the sak yant, Thailand’s spirit tattoos, and the men and women who make them come alive on their skin.